Today my best friend from school married her boyfriend. They’ve been together over 6 years ish (maybe – actually it could be closer to 7 or even 8). I rarely do WIW posts because I usually don’t have anyone to take a picture of me. 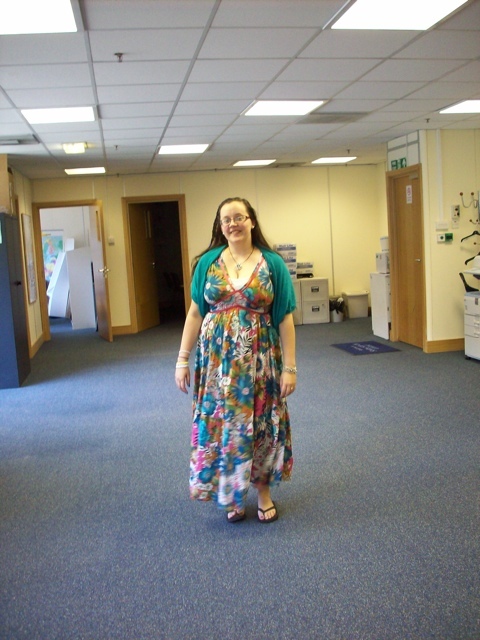 Then again because it’s funny at work that I’ve dressed up for the day my colleague took my picture and sent it round. So here is me stood in our office. love the dress! and the cardigan goes perfect with it! Thank you muchlie!! Have a letter for you. The first half is typed and the second half is going to be hand written as today when to pot with regards to writing to you. Then again I’ll try and get a Cornish postmark on it for you. This looks so girlie and beautiful! Would have been so nice to see it on sunday. Hope the LEJOG trip is successful. Thanks Kewey. I hope it all goes well. Tell Bex to enjoy it!!! Would you believe that next week I’m in Bakewell and could come see you on my way home but you won’t be there. On the other hand if you want someone to bounce ideas off for school my phone should be on loud all day Monday. Hugs! !